The Yowza Captiva elliptical trainer integrates several innovative features. Their “Variable Motion” makes it possible to choose any stride length between 18 inches and up to 32 inches on the fly. Not only does this make it suitable for both short and very tall users but the different stride lengths emphasizes different muscle groups, resulting in a much more productive and intense workout. The second innovation is their “counter rotational core motion”. On elliptical trainers with handle bars for the upper body, the reality is that they don’t require much effort, with the arms going back and forth. In contrast, on the Yowza Captiva, you rotate your upper body, putting the various abdominal muscles to work. Sort of like doing crunches standing up. The Yowza Captiva also lets you change the incline of the elliptical motion up to 50pct grade, the equivalent of going up a very steep hill. This greatly expands not only the intensity of the training but also broadens the muscles used. Other manufacturers incorporate adjustable incline but no one goes up to 50pct like the Captiva elliptical trainer. The Yowza Captiva is designed with a heavy 43 lb flywheel, resulting in a very smooth and stable elliptical motion, and justifies a maximum user eight of 400lbs. Pedals are cushioned and positioned close together for optimum comfort. The display is backlit for easy viewing and offers a choice of 12 training programs, including a heart rate program, keeping the user in a target heart rate zone. The Yowza Captiva can also track the profiles of up to 9 different users, great if the machine will be used by several family members. Pulse rate is monitored 2 ways, with contact grips or wireless chest strap. As expected on an elliptical trainer of this caliber, the Yowza Captiva includes a MP3/Ipod docking station playing through a built-in speaker system, adjustable cooling fan and water bottle holder. Yowza also includes free shipping in their price. Warranty on the Yowza Captiva elliptical trainer is excellent, lifetime on the frame and braking system, 5 years on parts and electronics and 1 year on in-home labor. Yowza considers the Captiva elliptical trainer to be “the best elliptical on earth”. 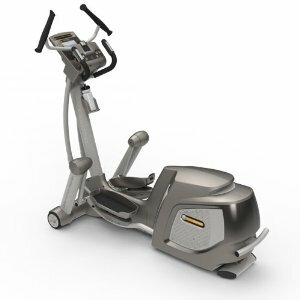 Discounting for hyperbole, the Captiva certainly is an excellent high end elliptical trainer that still costs significantly less than other top of the line models and offers features not found elsewhere. Highly recommended.